Take a look at our new slots here. The ancient warrior silences the gong and decided to develop a 5 reel slot based around his culture and beliefs. The result is Cheng Gong, an oriental themed is perfect for anyone interested in Chinese history with terracotta soldiers, red dragons, and lanterns all featuring in this online slot game. Since 1997 Eyecon has taken online casino gaming to the next level for Wizardslots . This premium gaming developer is synonymous with stunning graphics, superior animations and effortless game play. With a game like Cheng Gong it is easy to see why Eyecon has become a leader in this market. Enter into the mystical world of Cheng Gong, set against a beautiful city in ancient China. Meaning ‘success’ or ‘luck’ in Chinese, this online slot game will give you all the magic and mystery of the Orient. You will have 5 reels to spin and 25 paylines to pick from. Gameplay starts at 1p up to 50p per spin. You can also select the number of rounds you would like to play out of 10, 20, 50 and 100 while clicking on the auto-spin button. Symbols are taken from its Chinese theme and feature Dancing Princess, a Red Lantern, a Dragon, and a Terracotta Soldier, a Bronze Tripod Vessel used for rituals, a Ceramic Vase, an Umbrella, a Painted Face, a Water Canteen, and a Hand Fan. Read more information below and learn why this is popular and included in the top-rated UK slots list. The Dancing Princess symbol is a two in one symbol, she represents both the Wild and the Prize Pick Scatter. 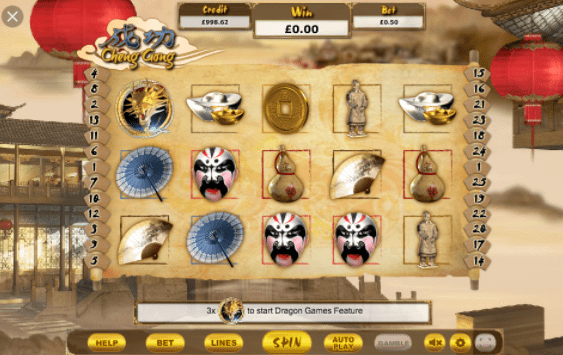 The Wild symbol replaces every other symbol except the Scatter which is the Red Lantern and Dragon Symbols in this online slot game. If the Wild symbol completes a winning combination your prize amount will be doubled. If 3 or more Dancing Princesses appear on the reels the Princess Prize Pick feature is triggered. You then get to pick one fan out of two and you may win another pick if the Bonus Pick is discovered. A maximum of 3 Bonus Picks can be won, and the last one will give you multipliers of x30 or x100 of your total bet amount. If you trigger 3 or more Red Lantern symbols the Red Lantern Prize Pick feature is activated. This feature rewards you with a pick for every Red Lantern in a triggering combination. You get 6 free spins with a 2x multiplier free spins in this bonus game. If you spin 3 Dragon symbols you’ll be rewarded with the presence of an extra dragon. This entitles you to a free credit prize. These prizes vary in value, the lowest magic dragon prize starts at x10 your bet increasing up to x100 the bet value for the top prize. The Dragon Re-spins can be triggered if the Dragon symbol appears in every of the first three reels. You get 5 free spins when this feature is activated. During the free spins feature, the first free reels are frozen, and any additional Dragon Symbols will be added to reels 4 and 5. As a common hallmark of an Eyecon game, the graphics of Cheng Gong are nothing short of spectacular. 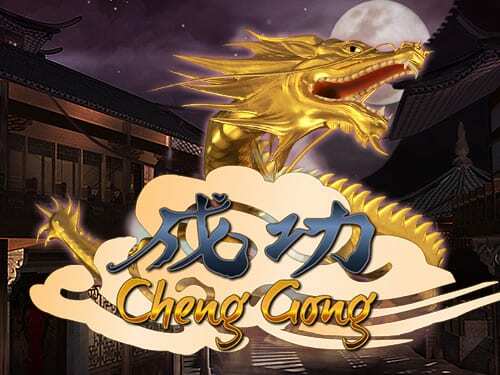 Transport yourself to ancient China in this online slot game which has been widely billed as being the closest thing to real life gaming. And if you’re lucky, you could win really big when you absorb the luck of the Chinese. Play Cheng Gong today and seal your fortune.